A couple of days ago we reported about some new leaked images, price and launch date of the Xbox One S All Digital Edition via Winfuture. 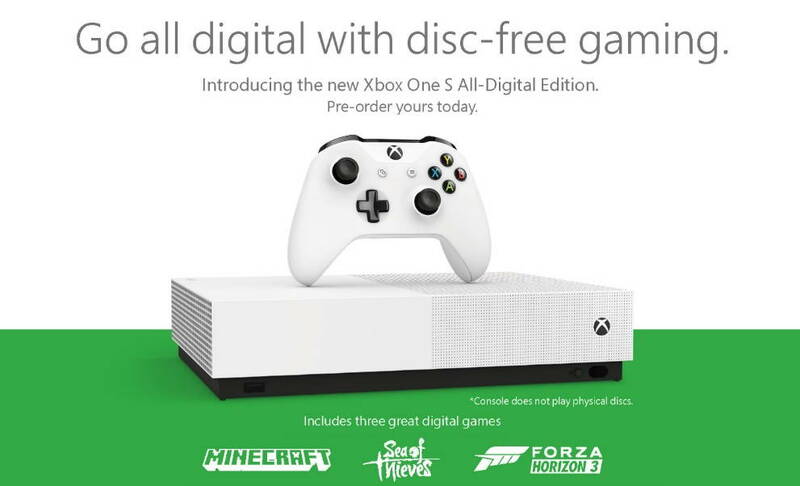 Now, Microsft has finally launched the new Xbox One S All Digital Edition that doesn’t use an optical disk drive and provides a disk free gaming. As its name suggests, you won’t be able to use a disk to play a game. The new Xbox One S All Digital Edition only provides gaming digitally. You can download the game onto the 1TB of internal drive provided with the console. Design-wise, the new Xbox One S All Digital Edition looks identical to the regular Xbox One S console, but it lacks the disc drive. The Xbox One S All-Digital Edition has been priced at $249.99 (roughly Rs. 17,300) in the US and will be available in the country starting May 7. The new console is also up for pre-order now from the Official Microsoft store. As it was revealed earlier, the new Xbox One S All Digital Edition will ship bundled with three games including, Forza Horizon 3, Minecraft, and Sea of Thieves. If you compare the price between the two variants, the Xbox One S All Digital Edition costs $50 USD less than Xbox One S. With its new Xbox One S All Digital Edition Microsoft is also offering a free trial of the Xbox Game Pass service for new users. The Xbox Game Pass lets you access and play games from an ever-expanding library of over 100 games for free. The new Xbox One S All Digital Edition will also be available through select retailers worldwide including Walmart, Best Buy and Amazon.com beginning May 7.